Fadlan mina Allahi wa ni'amatan..
a Grace and Favour from Allah..
And unite him (the Beloved Messenger) with me, just as You joined the soul with the nafs, outwardly and inwardly, in wakefulness and in sleep, And make him, O Lord, a soul for my body in every respect, in the here and now, before the next world to come, O the Magnificent One. A seeker went to ask a sage for guidance on the Sufi way. The sage counseled, "if you have never trodden the path of love, go away and fall in love; then come back and see us." The Sufis are called the Doorkeepers of Love. Secret of the Sufi Path is concealed within Love (not love as the world commonly understand it, but an exalted Elixir of Love bestowed only through Grace) and particularly for the Sufis, its overflowing (fayd) manifestation is through the love for the Habib Allah (Beloved of Allah), the Seal of Prophets and God's Messenger, Muhammad, may God perfect our love for him. 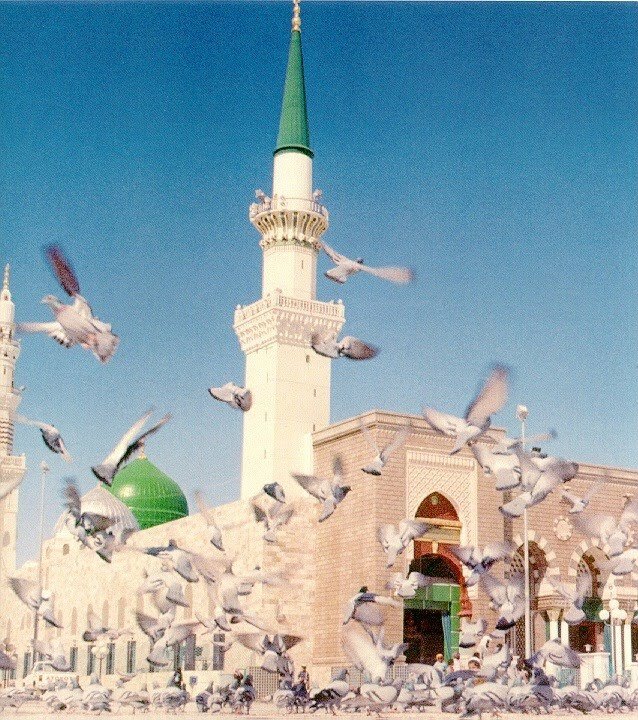 Its an open secret that the greatest of the great Sufi Masters, the Spiritual Pole of their time always had one thing common without exception, and that was their immense love ('ishq) for Prophet Muhammad. From the blessed life-time of Prophet Muhammad, the love that was given in the heart of his companions for him, is totally unheard of, never found in history both before and after, and in some cases were neo-platonic love (famous among them is the case of Uwais Qarni who lived in the time of the Prophet, but never physically met him, yet his love for the Messenger surpassed many of his most intimate companions, thus Uwais became known as Ashiq e Rasul, Lover of the Messenger and was instructed by the Messenger to be given his garment after his passing, a sign of Sufic transmission of baraka). 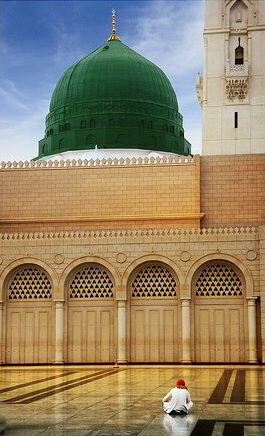 There is no doubt among historians as well that no other human being in human history commanded more faithful and uncompromising love during his own life time than Prophet Muhammad. Any authentic spiritual tradition always emphasis on love; and definitely the love for its spiritual Master and heirs (true followers) of the Master. The alchemy of the heart which happens by love and through love alone - is something which is impossible to produce by any other means. Those who know and realize this wisdom are indeed very fortunate. 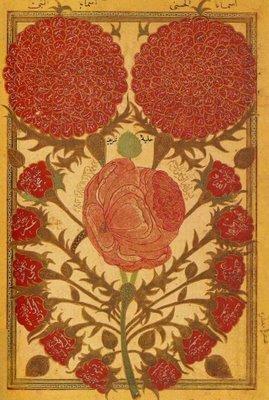 Through love for the Teacher, Guide, Murshid, Master - Love is unveiled to the heart (made known) and experienced by the soul. So is the reality of Love for the Sufis, for whom, love for the Messenger of God is an indispensable alchemy. The sincerity, love, devotion, fellowship towards the Messenger thus constitute part of one seamless reality for the Sufis - of the sincerity, love, devotion and fellowship towards God. One of the goal of Sufi training is to develop mystical awareness through meditation and praises of the Prophetic Light (Nuri Muhammad) that is contained in every heart of heart and to manifest perpetual presence in the reality of the Mentor. As the Divine voice instructs, "If you love God, follow the Messenger and God will love you." First is love for God ascending, witness, realized and actualized by following the Messenger, and then the blessed and precious descent of God's love envelop. Its important to note that the sacred formula: la ilaha illallah Muhammad Rasulullah is without an 'wa' or 'and' in between "la ilaha illallah" part and "Muhammad Rasulullah" part. There is no separation between the reality of God and His Messenger, love for God and love for Rasul. which lead me to the love of You. The greatest Sufi Masters who each were spiritual power house of their time, who were guide of not just few souls but thousands upon thousands, spanning across many generations, such powerful teachers of sacred knowledge and guide they were - in their individual journey in the path of Perfection - all of them strove to perfect their love for the Messenger, the Archetypal Master for the sufi mystics to whom goes back the original connection in every mystical path (tariqa). 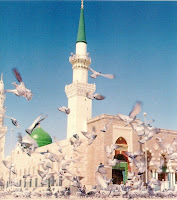 All the great Sufi masters were Asheq-e-Rasulullah, lover of God's Messenger. Ahmad ibn Idris al-Fasi (1760-1837, Morocco) was one such great lover of Rasul, a Qutb of his time, an enigmatic saint and a lighthouse of Islam. May Allah bless him and sanctify his station. He is described as one of the major inspirer of the spread of Islamic brotherhoods in Africa. He received transmission from Shadhiliya Sufi lineage and established in the tree, his own branch, Idrisiyya (Mohammediya Shadhiliya) Tariqa. As a prominent teacher of sacred knowledge in Mecca early in the nineteenth century, he is credited with inspiring a number of great disciples who subsequently established orders of importance to the modern history of African Islam. Many scholars now call the group of orders resulting from Ahmad Ibn Idris' teachings the most powerful school of modern Islam. Through his tireless inspired transmission, teachings, his prayers and litanies, his students and their students, he has exercised an enduring influence that stretches from North African east to Malaysia and Indonesia, north to southern Yugoslavia and Istanbul and south along the East African coast. In northeast Africa, his influence was especially profound through such students as Muhammad b. Ali al-Sanusi, Muhammad Uthman al-Mirghani and Ibrahim al-Rashid. As it happens to the greatly refined souls, the testimony of Love for the Messenger is rewarded by a true, awakened vision of the Prophet in which the Messenger appear, in some cases, converse and bestows special blessing to his asheq (lover). For those who are brought near (Muqarrabun), this vision is reported to happen in waking state, not in sleep. 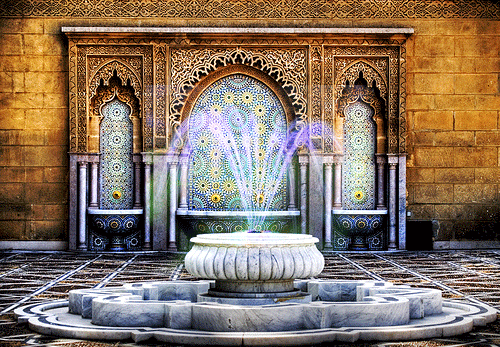 This constitute part of what Sufi Masters call, Fath al-Kabir, or Grand illumination / enlightenment or Great Opening. "This ... is founded on an inner submergence accompanied by a visible manifestation when you see the Prophet himself, may God bless and grant him peace. This is the outcome when you try to follow him in your words and deeds, when you busy your tongue with saying the tasliya (benediction upon the Prophet) and repeating it at every moment in public and in private until the glorification of the Prophet, namely tasliya, overwhelms your heart and permeats your deepest self, so that you quiver when you hear him mentioned, and the vision of him takes hold of your heart and you see his form before your inner eye. Then God will bestow upon you His clemency, outwardly and inwardly. Thereafter, you will see a Vision of the Prophet in many of your dreams while asleep as a first step; secondly you will see him unexpectedly while between awake and sleeping state. Finally you will see him awake." 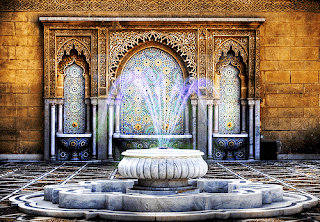 Ahmad Ibn Idris was graced by not only one but a number of such awakened vision and he was transmitted special litanies and prayer by the Prophet himself. 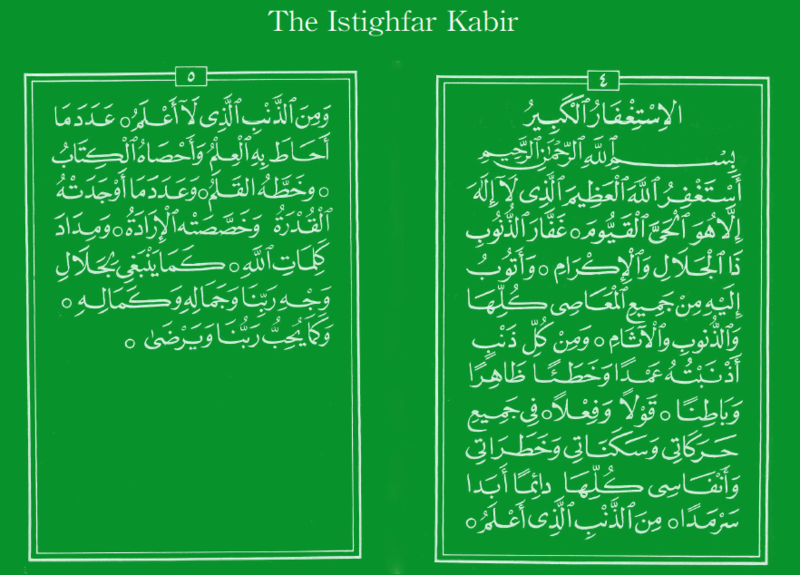 In one such blessed visitation of Prophet Muhammad and Khidr (the immortal guide of soul), Shaykh Ahmad Ibn Idris was gifted with a special prayer which is prized by the Sufis in great value and considered extraordinary in merit for those who recite and "work" with it. fī kulli lamhatin wa-nafasin, ‛adada mā wasi‛ahū ‛ilmullāh. "God alone is the Divine Reality of Which Muhammad is the Messenger" in every glance and every breath, as numerous as all that is contained within the Divine knowledge. 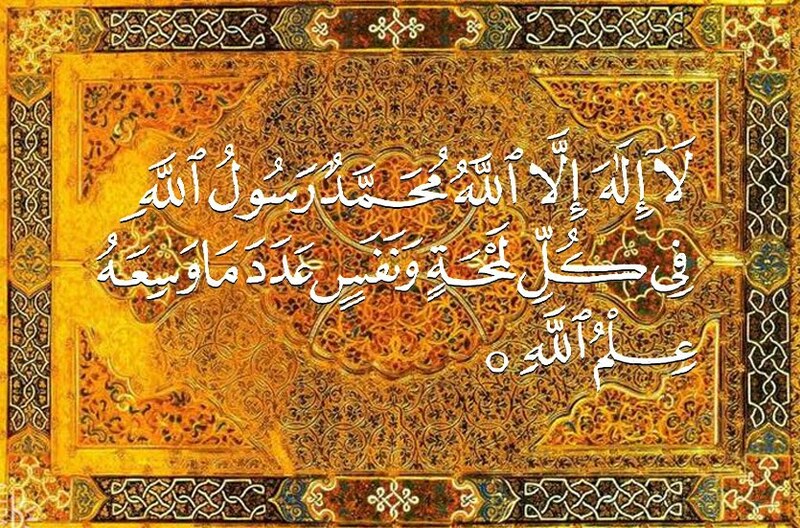 In every glance and in every breath, as numerous as that is contained within the Knowledge of Allah, the Great. outwardly and inwardly, in wakefulness and in sleep. In the here and now, before the next world to come, O the Magnificent One. I seek the forgiveness of Allah the Great, there is no divine reality but He, the Ever Living, Sustainer of Life, the Forgiver of our mistakes, the Majestic and Generous. And I turn to Him in repentance from all acts of disobedience, and all short comings and offenses. From every error that I have committed intentionally and unintentionally, openly and in secret, in word and deed. In my every action and my every stillness, my every thought and my every breath, always and forever and eternally. From the error committed that I am aware of and the error committed that I am unaware of. To the number of all things contained in His knowledge, registered in the Book of Life, written down by the Divine Pen, and to the number of all that His omnipotence has created, and His will chosen, and as much as the mystical ink of Allah’s words. As it befits the Majesty of the Face of Allah, and His Beauty and Perfection, and as our Lord wishes and as He pleases. While bestowing the 3 gifts: namely the dhikr, the salaat, and the istighfar the Messenger of God calls them, "the keys to the heavens and the earth" which means the entire panaromic manifestation of all that is, the entire treasure of the kingdom of God so to speak. The dhikr, salaat and istighfar are 3 essential provisions that a seeker must keep and with which he or she travels. The dhikr or remembrance is the first provision, one use it to awake from the slumber of forgetfulness. The salaat or prayer or invocation is connection, sacred conversation of the heart of the seeker to the Soul of the Universe. 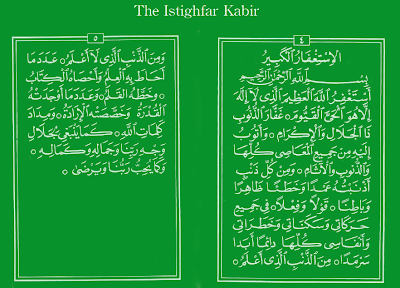 The istighfar or asking forgiveness is the robe of humility which only the truly gnostics understand the value of it in totality because with every advancement of the seeker, one more and more become bewildered and in awe of the Immensity of the Divine (Azeemiyya), and hence at that part of the journey the seeker realize that every praise falls short, every embodiment is less than perfect which is worthy as a gift to the Beloved. Hence the lover blush and ask forgiveness - which is the istighfar. 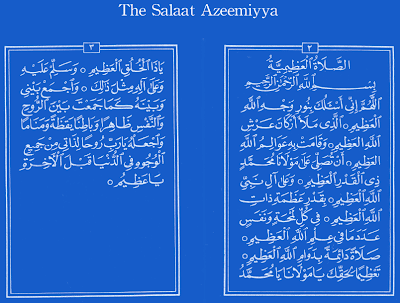 The commentary of the blessed words in the Salaat, specially that of "joining with the Rasul and him becoming the soul" is explained by the disciples of Shaykh Ahmad ibn Idris. This is graciously shared in the Riyadat an-Nafs blog. >> Click here to download and read the PDF. Professor Mark Sedgwick wrote in Saints & Sons: “Ibn Idris’ prayers are generally regarded by Sufis today as extraordinary, especially the central prayer, the Azimiyya...The Azimiyya has become popular far outside the orders deriving from Ibn Idris. It is used, for example, by Shadhilis in Tunis and by [Ba] Alawis (an ancient order of Hadramawti origin) in Singapore, and perhaps elsewhere (notably Indonesia and Malaysia). and Allah knows the best, He is the best of Giver, when He gives, there is none who can withheld, and when He withheld, there is none who can give. like the summons of one of you to another. An advice from Shaykh Saleh al-Ja’fari, may Allah be pleased with him: “You must act upon this advice which is more precious than gold and silver, and will make you race ahead of the horse riders in the race track, and that will, by the permission of Allah Most High, take you to what you desire, to what no eye has seen nor ear heard, nor has occurred to the heart of man. 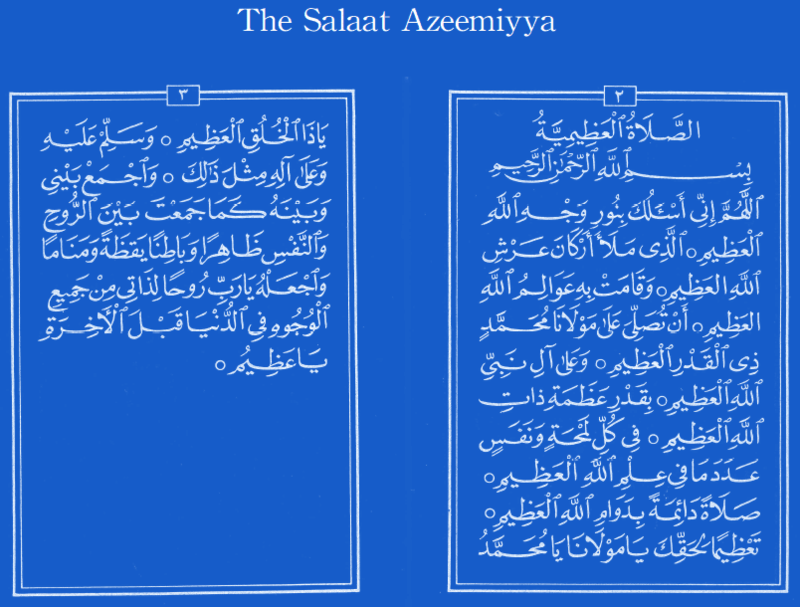 It is: If you wanted to read the Azeemiyya or any of the other Ahmadiyya salawaat, you must have wudu (Islamic way of Ablution, purification with water) and sit facing the Qibla, sitting on your knees, looking down, directing your heart and soul to the Prophet, salla Allahu alayhi wa alihi wa sallam, imagining his Muhammadan image / light in your heart, looking at him with the looking of real witnessing. And by that the veils between you and the one being witnessed, salla Allahu alayhi wa alihi wa sallam, will be removed, and he will look at you as you look at him, and love you as you love him, and he will give you from his sublime glances and his luminous soul, and so your soul will shake like the green twig shakes when it is given water. So hold on to this unique and powerful point of advice, especially if you are in al-Madina al-Munawwara in his masjid, salla Allahu alayhi wa alihi wa sallam, for that will be better and faster and nearer to what you desire. bi al mu'mineena raoofun raheem. Now has come unto you a Messenger from amongst your selves. ardently anxious is he over you. 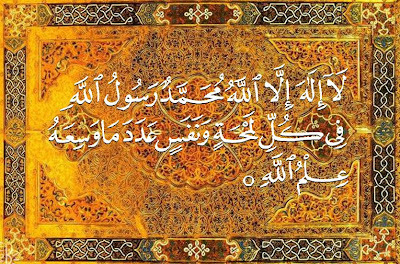 To the believers he is most tender and merciful.